The game’s main mechanic is deck-building, similar to Ascension or Dominion, but with much more interaction and a bit of what I’m calling “zoo management”. As you acquire more cards and start to build out your deck, you’ll also move cards from your deck to your Zoo. While cards are in the Zoo, you’ll earn points, but you expose yourself to other players who can steal cards from your Zoo. So there’s a back and forth strategy between building up your Zoo or making your deck stronger. I’ve already started to play test the game and so far the response has been very positive. I’m excited to develop this game fully and get it out to Kickstarter later this year. Keep an eye out for that! 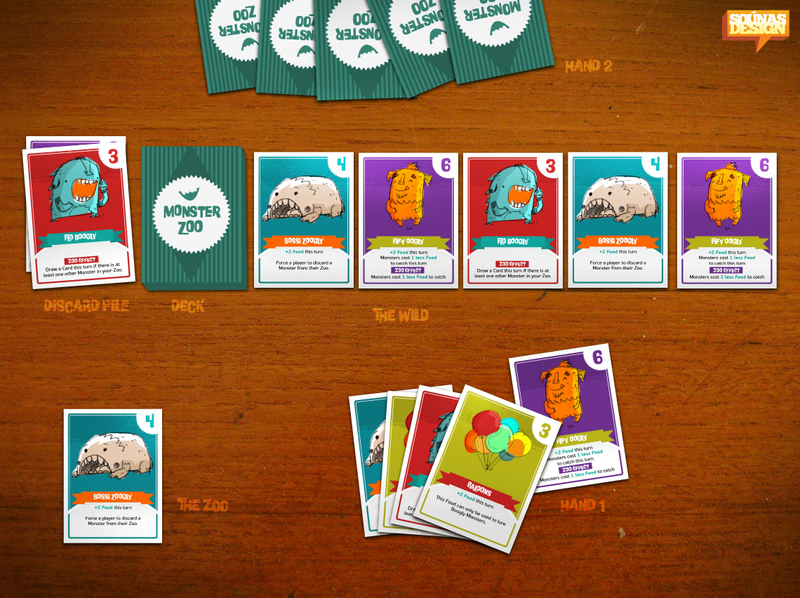 Monster Zoo is a deck-building zoo management card game for 2-4 players that lasts about 30 minutes. I’m really looking forward to your feedback. This entry was posted in Game Design, Monster Zoo, News on March 25, 2013 by Michael N..
Monster Zoo: Draft is a card game that I have been working on for the past month. It’s a lighter, easier to play game with the same theme as it’s older brother Monster Zoo. In the game, players take on the role of new Zookeepers, trying to fill their empty Zoos with Monsters from the wild. The game’s main mechanic is card drafting (inspired by 7 Wonders & Sushi Go). Players are dealt 7 cards to start the game. Each turn, all players choose 1 card from their hand, plays the card, and passes the remaining cards to the player on their left. As cards go around, players will be trying to complete sets of Monsters and prevent other players from doing the same. You can try to build a large set for a ton of points, but run the risk that another player will stop you from completing your set. There are also special cards that add deeper strategy elements. The game should feel light and fun to play with a wide variety of ages and gamers. Monster Zoo: Draft is a light card drafting game for 2-5 players that lasts about 20 minutes. I’m eager to hear your thoughts! 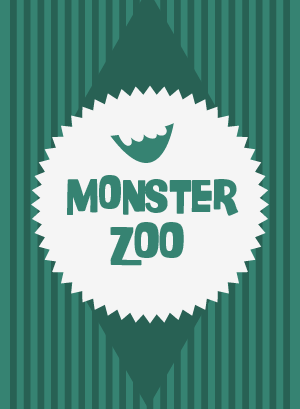 This entry was posted in Game Design, Monster Zoo: Draft, News on March 9, 2013 by Michael N.. In Monster Zoo, I try to keep cards balanced according to their cost to acquire. Cards with stronger effects typically have higher costs and weaker cards have lower costs. However, after a few rounds of play testing Monster Zoo, I realized that some cards in the game were out of balance. A few cards felt really strong and could easily sway the game towards a player’s favor quickly. And a few cards seemed really weak, when played they had little effect on the game or felt too expensive to acquire. One of the best discussions I could find on the topic of balance is a lecture from Ian Schreiber on Transitive Mechanics and Cost Curves. In the lecture, Ian talks about breaking down all the individual effects of your game into two things: costs and benefits. By doing this, you can get a sense of how balanced all the components of your game are relative to each other. If a particular item has a much higher benefit to cost ratio than other similarly costing items, then you know something is out of balance. Here’s how I went about applying this principle for Monster Zoo. After identifying every effect, I then gave a rough benefit score to each effect in relation to other effects. Then I added up the value of every benefit per card, giving me a benefit total score. Now I have a rough cost / benefit comparison for each card. But it’s hard to really get an idea of where some of the cards might be unbalanced. Let’s look at two specific examples. Monsters cost 1 less Food to catch this turn. Zoo Effect: Monsters cost 1 less Food to catch this turn. Based on the cost curve, you can see that this card has much more benefit than it’s cost. So we have two options here, we can increase the cost or we can reduce the benefit. I happen to think it’s a fun card to play with, so I’ll likely test increasing the cost. Double all Food gained this turn. You can see how Yummli Oogly is fairly weak, on the cost curve it is seriously below everything else with a cost of 6. Having 2 Chunky Ooglies would be much better for the same cost. In this case, I might add an effect to Yummli Oogly to get it back in balance. This entry was posted in Game Design, Monster Zoo on February 21, 2013 by Michael N..
As a new game designer, I’m finding that there isn’t much information around game design or game balancing. Seems like most of us are starting off with paper & pen, whipping up a quick prototype, and then immediately playtesting. I started Monster Zoo off the same way. However after a few rounds of playtesting, I realized I need something that I could use to see how the game looked from an overview. Enter Excel/Google Docs. Here are a few of the tricks I’m using to make my life easier as a game designer. The card file makes it easy for you to make changes to the game and gives you quick sense of how your game looks. But what if you need more detail around specific card types? Maybe you are interested in knowing if a certain card type is out of balance? For example, in Monster Zoo, there are three types of monsters: Ooglies, Booglies, and Zooglies. How can I tell if there are too many Ooglies? Or if the cost of Ooglies are too high compared to Zooglies? This is where Pivot Tables can help. Pivot Tables provide you with a way to summarize your data, so you can easily understand what is going on. It’s great for getting an idea of how your initial game balance looks. Let’s get back to answering a few of my questions about Monster Zoo. How can I tell if the three monster types are balanced from a cost perspective? This shows me that all three monster types are relatively balanced – the cost average ranges from 3.9 to 4.2. Pretty close. Now what if I want to know how the different card strategies are distributed throughout the game? Monster Zoo generally has three basic strategies: card advantage (you draw more cards than other players), point advantage (cards help you gain more points), or resource advantage (you are able to catch more Monsters than other players). In general, I want these all to be relatively balanced, but I’d like to have less card advantage in the game because that tends to have an effect where players keep drawing cards but nothing new is happening. I can see that the game is more heavily skewed towards resource advantage and points. Which for now is good. One of the bigger balancing issues I had with Monster Zoo is trying to figure out the right number of each card type in the central deck. Too many of one type of card and the game didn’t see enough variety. But too little of one type and it possibly could bog down. This is where the function HYPGEOMDIST can help. HYPGEOMDIST represents the hypergeometric distribution This function helps you understand the probability of a certain card being drawn from a deck. For example, I used HYPGEOMDIST to calculate the probabilities of each card type showing up in the first 5 and 10 cards drawn. This shows me that it is almost guaranteed to have a Monster card show up on the first turn draw from the central deck. There’s only a 40% chance that a Visitor card will show up on the first turn, but by the time 10 cards are drawn, that chance goes up to 65%. X stands for the number of a certain card that you have in the deck. Y is the number of cards in the deck. Z is the number of cards you are drawing. Both Google Docs and Excel have a shortcut function called HYPGEOMDIST to make the calculation easier. 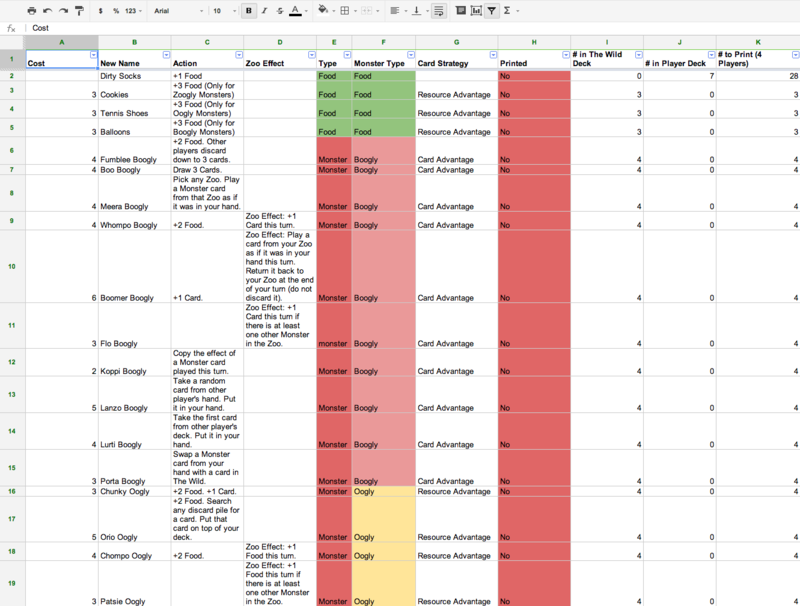 Another thing spreadsheets are good for are modeling game progression. For example in Monster Zoo as you gain cards and shuffle them back in your deck, you are changing the distribution of resources in your deck. As the game designer, it’s good to understand how the amount of resources are changing because this effects what your players can afford each turn. This shows me that over time, most players should be able to afford more costly Monsters. If I end up modifying the average +Food on a Monster card, you can see how that affects a player’s buying power in later turns. I hope I’ve helped show off some of the interesting game design tasks a spreadsheet can help you with. Looking forward to hearing some of your tricks and tips. This entry was posted in Game Design on February 12, 2013 by Michael N.. 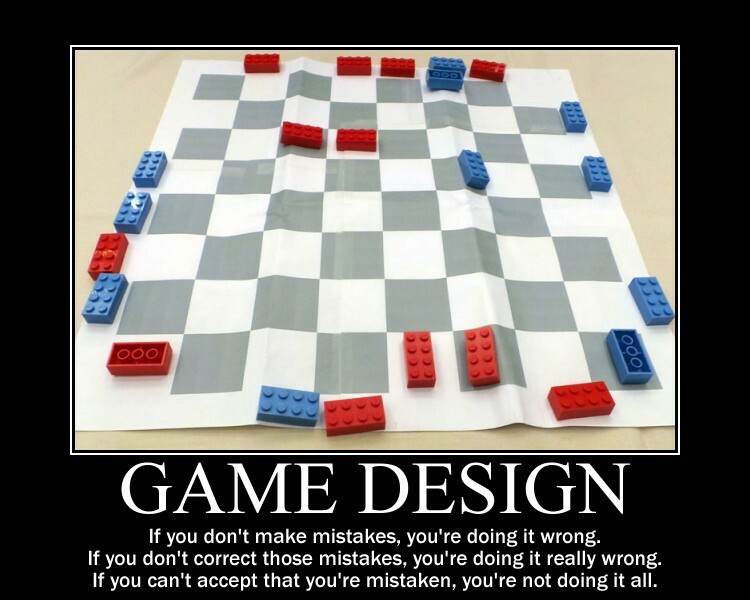 Inspired by a great article on game design as science and art. Image from Jonathan Liu. This entry was posted in Game Design on February 9, 2013 by Michael N..
As I set out to design my first game (don’t worry I’ll talk about it soon), I spent a lot of time thinking about luck and skill. I am generally a fan of very strategic and skillful games, ones with very little amount of luck. But in designing this game, I knew I wanted to make it accessible to a variety of players – specifically kids and casual gamers. The NYU Game Center Lecture Series: Richard Garfield from NYU Game Center on Vimeo. In the lecture, Richard highlights the benefit of luck in game design. Games with luck tend to be more engaging because even lower skilled players have a chance at winning. A few of the first versions of my game were very strategic and limited the effects of luck. As I continued to playtest, it was obvious that introducing more luck into the game made it more fun and easier to play. For games that are targeted to a more casual audience like family games, I think involving an amount of luck is a good thing. To add more depth to the game, skill should allow players to influence the impact of luck. Starting a new journey is an exciting and scary adventure, you never know where it will lead, where that first step will take you. Inspired by my wife and son, I’ve decided to venture into the land of game publishing. This is my first step. The blog will be primarily about Ruby Cow Games and it’s progression from an idea to a real games publisher. I’ll discuss how a game is taken from idea to a physical product as I am working through the process. I imagine things won’t always work out smoothly, so we’ll talk about all the setbacks as well. I will discuss game design and games that I am working on. This is something I have become increasingly interested in over the past few years. I’m hoping that this will generate some lively feedback about the games and help me improve them. There will also likely be some other random topics, although I’ll try and keep things focused on game publishing, game design, and Ruby Cow Games. As for where this will go, we’ll have to see when we get there. Thanks for taking this first step with me. This entry was posted in News on February 8, 2013 by Michael N..